Christmas time is associated with colder weather, and colder weather is associated with frost bite on hands. Because frost bite is something I'm terrified of, at this time of year I always kick this away with a dollop of hand cream here and there. However, hand creams are one of the things I hate using most....BUT THIS ONE - LIFE CHANGING. I'm talking about the Triple-Function Hyaluronic-Rich Hydrator by DECIEM. You may have seen products by this company on the shelves of Boots but you can also purchase their products through their website which currently offers FREE INTERNATIONAL DELIVERY. They have 10 brands, but at the moment only 5 are available. Having tried a product from each of their brands available so far (further reviews about them will be up), I look forward to trying the new brands too. But now onto the hand cream that I am talking about today. 1. Smells amazing - it doesn't have that perfumed smell or floral smell that most hand creams tend to have but a fresh scent of lime and lemons. For me that is the typical smell that reminds me of cleanliness...a smell I like on my hands. 2. Disappears - the reason why I hate most hand creams is because after applying them you can barely do anything with your hands as they remain so sticky and slippery. I HATE THAT. Honestly when I tried this one and put a pea sized amount on my hand I thought 'Oooo this is just another hand cream!' It has quite a thick texture so you expect it to be sticky. Surprisingly, it is not. It disappears into the skin instantly and after a few seconds you start doubting if you actually applied hand cream or not. This for me was a winning point. 3. Long lasting - it leaves your hands feeling soft and protected. This is not a momentary feeling but one that lasts for hours. I have applied this a couple of times before I went to bed and in the morning I woke up thinking 'Why are my hands so soft?' and then I realised...its because of that amazing hand cream. 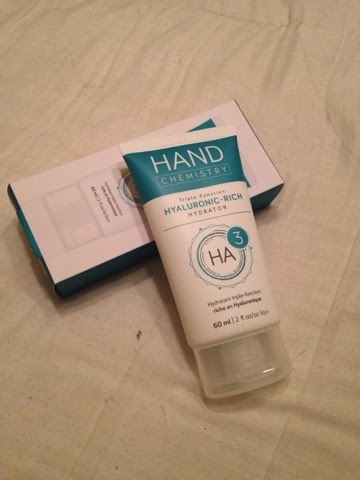 I am really impressed by this cream and it does do what it says on the packaging; hydrates below and above the surface of the skin and forms a protective glove. This could be amazing as a stocking filler this Christmas as its good for anyone to have in their handbags. Plus, it comes at a really good price - €8. Meanwhile, I may have converted to using hand cream thanks to DECIEM and Hand Chemistry.